The Beach (in blue), 4"x4.5"
My poor blog is feeling sadly neglected...and I completely understand why. The poor thing hasn't been updated since in 6 months! Do you ever feel like life just gets in the way sometimes? We just registered little Ella for first grade and Eva will start her last year of preschool in the Fall...I just can't believe that my babies are growing up! Ella will be 7 in a month and I just don't know how that is possible. It seems like just yesterday we were bringing her home from the hospital, she was learning to walk, beginning preschool...geez, how do I slow time down a bit? 2 kids in school, David coaching track, a last minute decision for David to start his master's program, a family vacation to Disney World and a lovely visit with Florida family members, a crazy summer, softball, gymnastics...you get the idea. So now as summer is winding down, I find myself secretly happy and welcoming the return of school, cooler weather (hopefully), and settling into a normal routine (albeit hectic at times). 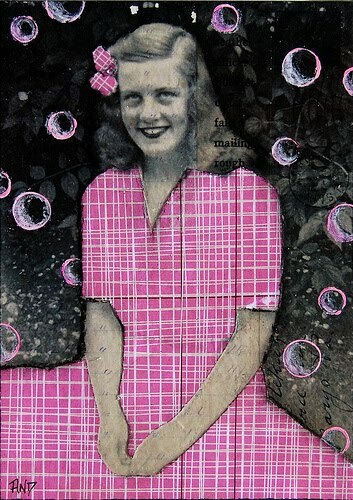 Ruth with Pink Bubbles, 5"x7"
September will also bring about my first attempt as an art fair vendor. This is a baby step...my way of testing the water...and something that I've avoided doing for several years now. I decided to start small...with a small outdoor art fair on a Saturday morning. I have no tables, no tent, no table coverings, and no idea how in the world I'll display my work...I'm looking forward to it. If any seasoned art show vets have advice on anything...please leave me a comment. I need all the help I can get! 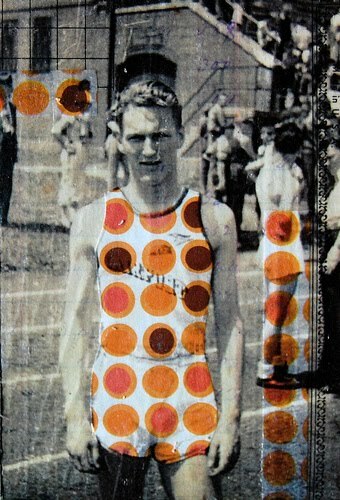 I just joined your blog as of this morning - I am a photographer and I would love to learn about image transfer - Do you transfer to fabric? 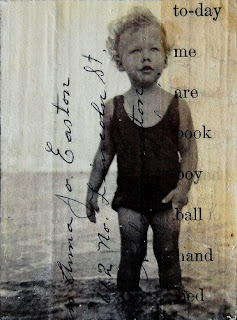 I love what you have done with your pics ... Love your site! I love the black and white background and the bright colors you put in the foreground. It really catches the eye and is really fun and crazy. Beautiful work. 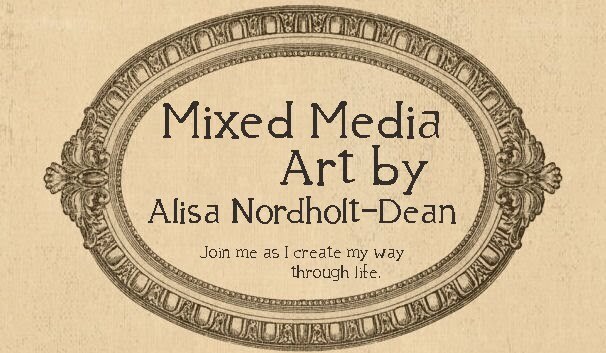 Alisa Nordholt-Dean is a self-taught mixed media artist with a passion for all things vintage. Her love of vintage photographs led her to begin incorporating image transfers into her mixed media work in 2008. 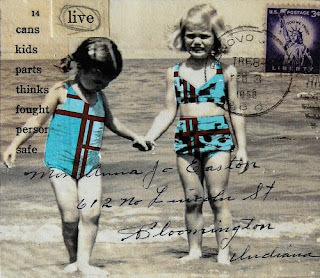 She teaches workshops locally, and her work has been published in Somerset Studio magazine and Playing with Image Transfers: Exploring Creative Imagery for Use in Art, Mixed Media and Design by Courtney Cerruti. She is also an avid front yard gardener in Central Indiana and enjoys every aspect of growing - from starting seeds in the winter to reaping a bountiful harvest in the summer. Her garden is ever expanding and includes a wide variety of fruits and vegetables - from heirloom tomatoes to strawberries and potatoes. She enjoys a challenge and encourages everyone to grow their own food. Alisa Nordholt-Dean. Simple theme. Powered by Blogger.